I intended to post this last night as normal on a Sunday, but the time I got half way through it all it was getting late. So it has been delayed until today, but I think it will be worth the wait. So the weekend just gone I knew what my tasks were going to be at Mustang Maniac, not cleaning up this time, but adding the last bits of pipe work and connections to the engine. I arrived and found Adam moving a load of new orders around in the offices and stock rooms where we discussed the plan of action for the day. I was given a collection of parts and made my way to the workshop. As I opened the door and found my new Magnum 500 wheels fitted with their tyres, one was already partly on the car, the guys thought that I would like to fit them on myself, which of course I did. The wheels were a special shipping order by Adam (as the last set were sold early last week), they arrived within the week ready to be fitted with tyres and balanced. All I can say is OMG they look awesome on the car. Thanks Adam for getting them so quickly. The protective paint over the white lettering will be left on for now until in the mean time of working on the car so they don’t get scuffed. As I was looking under the car Adam arrived with even more parts which were going to be fitted. Adam showed me the exhaust pipes that Yogi had fabricated as a custom fit from the oversized headers. 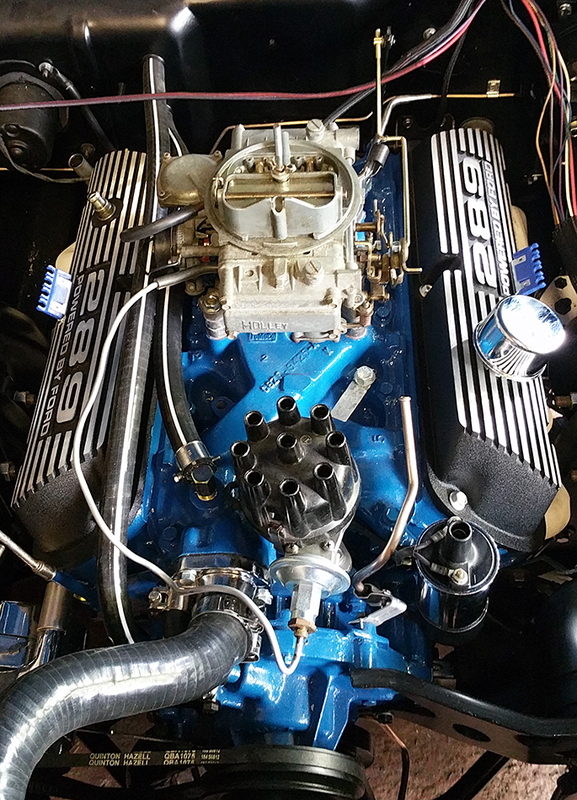 As the main pipes was slightly smaller than the three-inch header bores the step down was made to fit. As these headers sit low under the car, care was taken to clamp them up to give as much clearance as possible. At this point there is no H-pipe crossover as I wanted to hear what the engine note was like without it. This will be a mod that Yogi can do at a later date (but he don’t know it yet) if I don’t like it. Due to the larger exhaust pipes the standard hand brake lever will catch the pipes and so had to be modified to be out-of-the-way of the exhaust. Yogi worked his magic and redesigned the part which now has a gentle S-curve to it. You can just make it out after the white headers on the right hand side in these pics. I was told to take my carb back off again as I hadn’t put the correct gaskets in place. Adam spotted it on my blog and thought I had the correct ones. The gaskets would have worked what I had on there, but not how it should have been and could have caused engine running issues or not as smooth as it should be. So here is the correct sequence with the 4v gaskets and not the open style that I had previously had a half and half mixture of. Yogi has also been busy fitting the transmission cooling lines to the radiator which are made of Copper-Nickel. They look like copper to start with but are much tougher, harder to bend and will dull down and weather to look like the stock steel pipes. 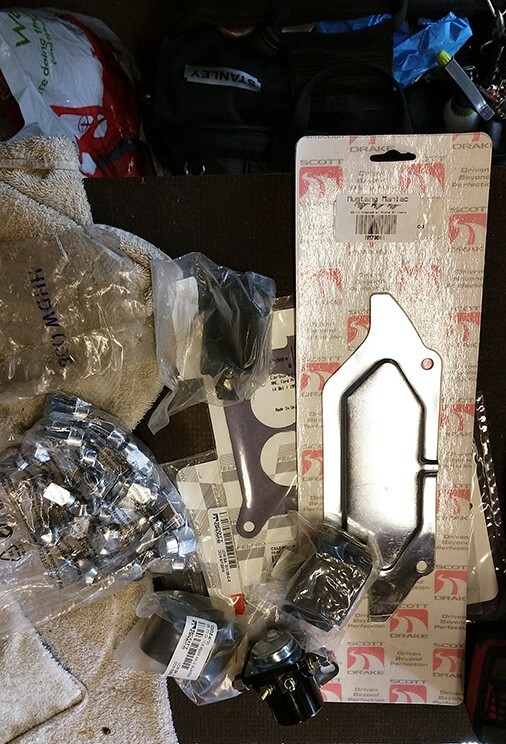 The fittings at the radiator are unique to Mustang Maniac as they were designed by them and have them made in batches. These hand crafted pipes are designed to follow the original route at the front but take a more custom line due to the headers and the starter motor. To get the starter motor in is a simple job, two bolts one top and one bottom, however, due to the space that is taken up by the headers this is no easy feat to achieve. In order to get the starter in place I had to remove the idle arm link and massage the transmission pipes out-of-the-way to fit it in place. The transmission pipes will come up behind the starter and be joined by the starter motor power lead when that gets added next week. You can see the mounting hole for the starter and then it’s a case of wiggle it in place and get a bolt in. The starter is a heavy bit of metal and the ideal scenario is to get it fitted in quick as possible before your arms start to ache. 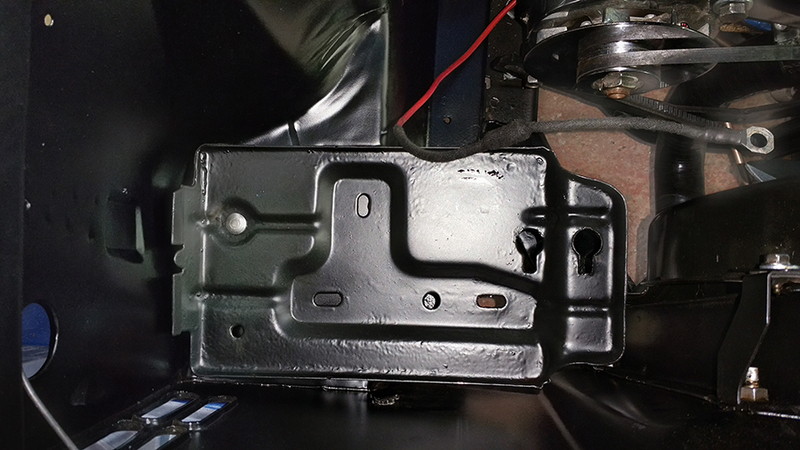 We removed the old rocker covers that were just resting in place, fitted the new gaskets to the new covers and started to fit the new covers in place. 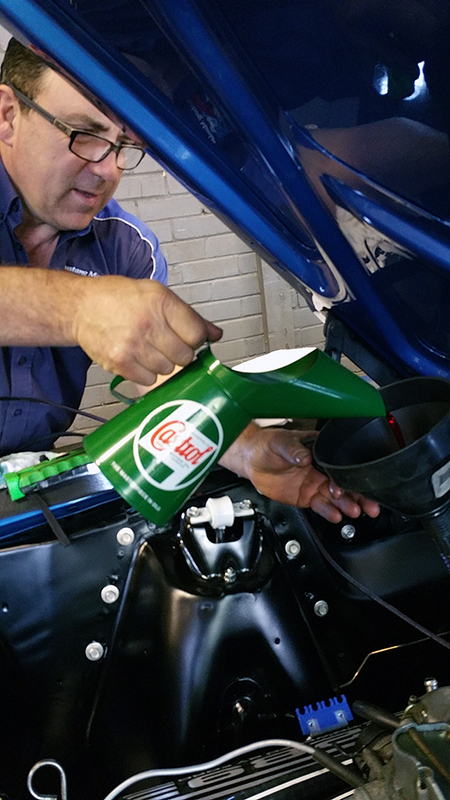 With the left side bank cover going on we then added some quality oil into the car to allow it to settle down to a level while we work on other bits. The transmission oil was added to the gearbox about half to start with then that was allowed to settle. While that was settling the front fan and power steering pump belts were added and tensioned correctly. It got busy with the battery tray and drilled the back location hole and tightened it all up ready for the Autolite battery to be put in place week. The PCV pipe was added to the right bank rocker cover and the carb spacer, brake booster pipe fitted to the back of the engine block, the ignition coil was added where I custom fitted the wires to fit their new location to look neat. Water was added to the radiator and the satisfactory gurgle and bubbling of the engine block was like a music to my ears. Just for now that is most of the pipe work and fluids added to the car. Of course the levels will be checked and topped up again after it has been fired up. Yet again the day was a long one yet I didn’t notice as time flies when you’re having fun, which I certainly was. That was all about my old spare wheel. The wheel was filthy dirty and needed some work. The wheel was given a proper clean inside and out to see what needed to be done in way of repairs. The result wasn’t to bad at all under the gunge. The rough bits of paint and rust were removed with wire wool and thoroughly degreased again. The tyre was in pretty good shape and was masked up and given a couple of light layers of red oxide primer and allowed to dry in the sun. before adding the last coats of the full painted oxide. The gloss black was applied after an hour or so once the red oxide had fully dried. This again was added in light layers and built up to give the final look. The masking was removed and the white wall cleaned along with the rubber tyre. The final result is a good a new spare wheel which will go into the trunk later on. 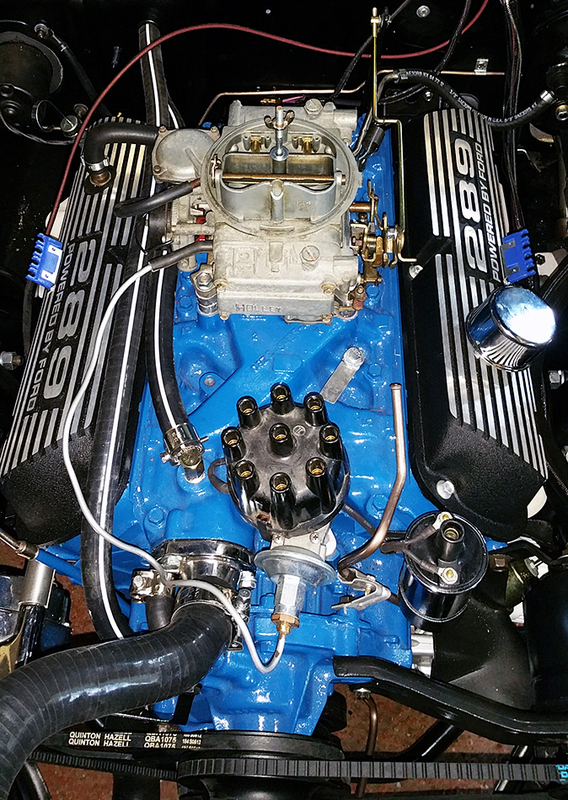 This entry was posted in Car, Photo's and tagged 289, battery tray, carburettor, copper nickel, exhaust, headers, Holley, idler arm, Magnum 500's, Mustang, Mustang Maniac, oil, One man and his Mustang, red oxide primer, rocker covers, starter motor, transmission oil. Bookmark the permalink. The Magnum 500 wheels look fantastic!! I just purchased a 66 coupe last weekend and I think I might go with the same wheels. Do you mind telling me the size? Diameter and width. The Magnum 500’s are 15″ x 7″ Chrome with gloss black (as they do a satin black centre too). The tyres are BFG’s which are P205/60R/15 The car will take 215/60R’s if you want a slightly wider tyre but they can rub on the fender/quarters under load. So that depends how you are going to drive the car, I just wanted to be safe for all things that’s all. The difference of 205 to 215 is only 10mm and you can’t really tell anyway. With these Chrome wheels you need to pay attention to the rust element. Where the outer rim meets the inner part of the wheel there is a gap, the water can sit in this gap and cause the dreaded pitting on the chrome to start. When I first got the wheels I sprayed Gibbs Brand into all the gaps i could see and soaked them good and proper and allowed them liquid to soak where the water would go. When I fitted the wheels I applied “Meguiar’s NXT All Metal Polysh” a few times to build up a barrier especially around this join, to make sure it was almost filled with wax too. When I clean the car now I can use Quick detailer or the “metal polysh” again just to keep the protection there. Brake dust falls away and does not stick either. The wheels look pretty cool when they are super sparkly clean.